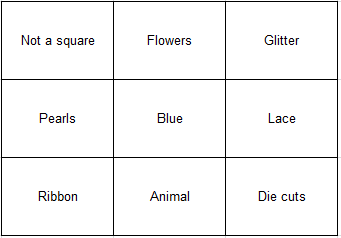 Her is Annettes bingo grid. or diagonally across the grid. The choice is yours, but don't forget to tell us what you've picked! please visit the ABC Christmas Challenge blog here. and the blue papers are from Maya Design. is from Penny Black, sweet and easy to colour. The ribbon is from IKEA, and the button is from my stash. I have cut it out in some glittery paper. This is such a fun card with a lovely colour combination. I like the hint of sparkle and the beautiful bow. Thank you for joining us this month at Penny Black and More and we hope you will join us again next month. This is a lovely Christmas card, such an adorable image and great shape. Beautiful!, Lovely shape and I love the colours! Thanks for joining the challenge at Sweet Stampin' this week! So cute! Love the added sparkle on the snowball. And a fun shape for the card, too. Thanks for playing with CSAYL. A very pretty Christmas card Dot using that sweet PB hedgie. Thanks so much for sharing with us at Penny Black and More challenge this month. Loving this card. Such a cute image and great card shape too. Perfect for our "masculine" card theme at Penny black and more. Thanks so much for playing along! That is so adorable! Thanks for joining us at Crafty Ribbons this week. Very pretty card. Love your design, image and colour scheme. Das ist eine tolle Karte mit einem tollen Motiv und in tollen Farben. Awww, such a sweet image! Using the blue with all that snow is a great combo. Thanks for joining in the fun at CSAYL! Thanks so much for sharing with us at Sweet Stampin' with this super cute card! awww this is so cute! I love that little hedgie!! Virkelig sødt kort igen med det sødeste stempel. Lækker stor die du fik dig købt der.